How should you shake hands with someone who is holding a cup of coffee in their other hand? I have tried this twice recently at church, and both times, I made the other person spill their coffee. I was using my normal handshake, which attempts to be firm and brisk. Should I abandon the general rule and give the other person a weak handshake if they are holding a beverage? Or is it a mistake to try shaking hands with someone holding coffee in the first place? I’m interested in the answer to this very serious question. Why do so many of us on the autistic spectrum have trouble making eye contact? Lack of eye contact seems to be one of the traits most often named as going along with autism and Asperger’s syndrome. Maybe that’s because eye contact is such an automatic thing for most people, they notice when it’s missing or brief, even in a young child. Think of how often people attach significance to eye contact or its absence: “I could see it in his eyes.” “She couldn’t even look me in the eye when she told me.” “He looked nervous; his eyes were constantly darting back and forth.” These sorts of conclusions aren’t always right, particularly with an autistic person, because it’s very possible to be sending out a signal you don’t mean to without realizing it. Someone might think I am looking down because I’m embarrassed by what I’m trying to say, when I’m actually just trying to concentrate on what I’m saying. This is just a guess, but I don’t think that things like eye contact or body language are innate, because it is possible to learn them and improve throughout your life; it’s just that learning to make “normal” eye contact usually seems to take a lot more work for autistics than for others, and it often needs to be a conscious effort rather than something that we absorb automatically. But what is it about the way our brains are wired that causes such a difference? One theory comes from observations of brain activity in both autistic and non-autistic people as they performed a task involving face recognition. Each hemisphere of the brain has a bundle of neurons deep inside it called the amygdala, and several studies have indicated that these parts of the brain behave differently in autistics than they do in non-autistics. Here’s where it gets confusing. I was all set to explain how experiments showed activity in the amygdalae for non-autistic people when they looked at human face to identify it or tried to read its emotions, while autistics showed little or no activity in the amygdalae. That’s what a study in 2000 found. But then I found a 2009 paper that reported the exact opposite! This study concluded that there was actually more activity in the amygdalae of an autistic brain than there tended to be in a non-autistic brain. When it comes to how the brain works, there’s a whole lot we don’t understand. So maybe autistics don’t tend to make eye contact because our brains don’t “latch on” to human faces as different or more significant than their surroundings in the way that neurotypical brains do. When I heard this explanation, I thought it was interesting, but something about it didn’t seem quite right. It wasn’t until I saw an ABC news segment about a remarkable girl named Carly Fleischmann that I was able to put it into words. Face blindness can sometimes make watching a movie an interesting puzzle. Usually, it’s easier to keep track of characters in a movie than it is people in real life– there are usually only a few major characters in a movie, and filmmakers usually try to give the audience a lot of clues about who’s who, knowing that the whole audience is usually being introduced to these characters for the first time. I usually find that if I make an effort to pay attention to the characters as they are introduced, I don’t have any trouble keeping up with the story. A scene here or there may confuse me, but 1) often I’m able to piece things together by continuing to watch, and 2) sometimes the filmmakers intend to confuse or unsettle the audience with ambiguity, and that too becomes clear if you just keep watching. But with some movies, face blindness can give me a lot of trouble. 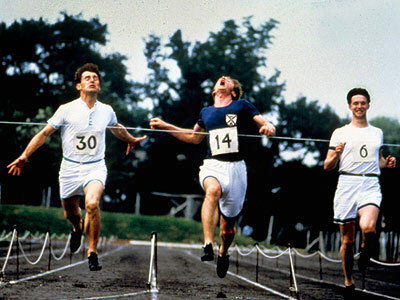 I was reminded of this when I recently watched 1981 Best Picture winner Chariots of Fire, which tells the story of runners who competed for Great Britain in the 1924 Olympic Games. I saw the movie for the first time several years ago when we rented it. It was one of my mother’s favorite movies, and at the end, she started talking about how it did such an effective job of presenting the stories of two athletes alongside each other in a way that caused you to think about the similarities and differences between them. But I hadn’t picked up on any of that. In fact, I had a hard time seeing the point of the story, because I had not been able to tell that the movie’s structure focused on the lives of two men in particular, Harold Abrahams and Eric Liddell. Harold Abrahams was an English Jew who competed in the face of racial and religious prejudice. His deans at Cambridge refused to support or encourage him, and Abrahams used the desire to prove them wrong as his motivation to become the best runner in the world. At the same time, though, the prospect of losing a race filled Abrahams with fear. Eric Liddell was a devout Christian from Scotland who planned to enter the ministry as a missionary, as his parents had before him. When he began devoting a lot of time to training for competition in the Olympics, his sister worried that he was placing his enjoyment of running (an earthly thing) ahead of doing God’s will. Surely winning footraces could not be as glorifying to God as being a missionary, could it? One of the interesting things about the filmmakers’ choice to focus on these two runners is the fact that their paths don’t cross very many times during the story. Abrahams and Liddell only compete against each other in the same race once, and that is not in the Olympics. Once they both arrive in Paris, they each have their own concerns to deal with and don’t interact much with each other. So it’s mostly an artistic choice to tell their stories in parallel, by cutting from one to the other.